Dr. Navid Rahmani is a leading dental implant specialist in NYC, multiple dental implants expert and one of few implant dentists in NYC to offer newest and most advanced dental implants in New York. We are using cutting edge techniques for placing multiple teeth implants. 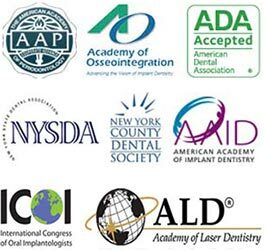 Dr. Our best rated dental implants center is located in Midtown Manhattan & Upper East Side, NYC. Material: We use only the best quality medical grade titanium or titanium alloy multiple tooth implants from Straumann, headquartered in Basel, Switzerland. It’s the largest and most advanced dental implant company in the world. Multiple tooth implants can be used to support quite large bridges. Where multiple teeth are missing in the same location, two or more dental implants can be used to support a bridge, making it an economical long-term solution for replacing multiple missing teeth. Who Can Have Multiple Tooth Implants? Procedure of placing multiple dental implants in NYC should be suitable for most people and age and gender is not normally a factor. Some women may see a significant decline in bone volume and bone mass as they get older and particularly after the menopause, the effects can usually be reversed through bone grafts. It is important that you do not have any active periodontal disease as this can lower the success rate of treatment. Certain systemic diseases can also affect the outcome of treatment. An initial examination with Dr. Rahmani will discover if multiple teeth implants is the right treatment for you. During this consultation, Dr Rahmani will talk about the treatment to ensure you understand the procedure more thoroughly and how it could help you. If you decide to go ahead then the next step is to take a cone beam CT scan and dental x-rays. See other Dental Implants Procedures we offer in our Upper East Side NYC tooth implants center. Using the information provided by the CT scan and your x-rays, Dr Rahmani will plan exactly where each dental implant is to be inserted. This type of planning does require a high degree of precision and Dr. Rahmani will spend an extensive amount of time making sure your implants are placed correctly. IMPORTANT! When placing multiple tooth implants it is extremely important that they are inserted in precisely the right position in order to make sure the dental bridge has the right path of insertion, meaning the dental implants must be parallel to each other. At the same time, it is vital to consider the overall aesthetics of the final restoration as there must be adequate room for the dental laboratory to be able to fabricate the bridge so it can function correctly and will look wonderful. Once your tooth implants are in place, they will need time to heal and to bond with your jawbone before we can place your new teeth, a process that takes between three and six months. During this time, we will provide you with a temporary prosthesis so you can eat and talk normally. During the first few days after placement of multiple dental implants in NYC Dental Implants Center you may feel some mild discomfort. We can advise you on the best over-the-counter painkillers to use or can provide you with a prescription. You may need to take antibiotics and to use a special mouth rinse during the first few days. Dr. Rahmani will also give you detailed instructions on how to care for your multiple dental implants during this initial healing period. We are always available if you have any concerns after surgery. Multiple tooth implants are a very reliable way to replace missing multiple teeth and are good for getting rid of loose and uncomfortable partial dentures. Mini dental implants can also be used to stabilize loose dentures They can be particularly useful in replacing teeth towards the back of the mouth and where there are no natural teeth remaining that could support a conventional bridge. Multiple implants can also be used where the existing natural teeth are not strong enough to support a bridge. All dental implants in NYC requires extensive planning and this is not the quickest way to replace missing teeth. Although multiple tooth implants can last a very long while, this does rely on good patient compliance. It’s important to keep up with regular checkups, even if you have no natural teeth remaining. Good oral hygiene is essential for keeping dental implants free from plaque as otherwise there is a chance they will become infected and could fail. Dr. Rahmani achieves very high success rates with this treatment because he will only recommend it for patients who are suitable. The extensive planning procedures carried out before surgery help ensure the multiple implants are correctly placed, providing patients with every opportunity of enjoying their new teeth for many years to come. If you experience any significant changes to your general health after the dental implant surgery then this could affect their long-term success and should be discussed with your dentist. The alternative to having multiple tooth implants is to use dentures, which is a far from perfect solution. Dentures rest on the gums and can accelerate bone loss. Many people also find dentures extremely uncomfortable to wear. A dental bridge may be a possibility if any existing natural teeth are strong enough to support the bridge. This may not be the case where multiple teeth have been lost as often any remaining teeth are affected by periodontal disease and bone loss, and may not be stable enough to support a bridge. What Is the Cost of Multiple Teeth Implants? The cost of treatment does depend on the number of implants required, the type of dental implant being used and the type of restoration. There may also be additional costs if bone grafts are needed prior to surgery. This treatment is not the cheapest, but it does frequently offer the very best long-term solution.